Gary Numan is just one of those people who is a legend or an icon, no matter your view on him you can’t deny his impact upon music, especially through the late 70s and early 80s. Ashamedly, I’ve only got into his music quite recently, as my music taste has evolved into something that adores synth-pop it has made the less accessible, accessible. I think Numan is less accessible due to his sheer power with synths, it really is a talent that is nigh on unmatched to this very day. Warwick Arts Centre is in Coventry (go figure) and right in the middle of Warwick Uni’s campus (go figure again). It’s a lovely little venue, currently undergoing reconstruction so there’s some building work about. It doubles up as a cinema as well which I found ultra cool. In the main foyet there was a makeshift table which was also the merch stand. The merch was ridiculously expensive, I don’t know when it became acceptable to charge £30 (T H I R T Y P O U N D S) for a tour tee, tees that are renowned for being poor quality and, let’s be honest, not that cool – and I’m an avid tour tee wearer before you start! There was signed versions of his new album, ‘Savage’, which were tempting but they were £50 ( F I F T Y P O U N D S) so merch was a complete no go for me. The support act, Nightmare Air, were absolutely brilliant. Loved every second of their performance, it was riveting from start to finish. If only they would have accepted debit cards after the show I would now own their album on vinyl. The band consisted of 3, from LA, which included a bassist/lead singer, guitarist and drums. It was the guitarist who always spoke between songs, weirdly the vocalist didn’t say a single thing throughout, it’s always strange to me when the front person of a band is too shy to talk to the crowd. It just takes away from the experience for me. They had such an atmospheric, almost, euphoric sound though you couldn’t help but bob your head along to it. I wasn’t crazy on the songs that the guitarist sung, purely because it was the whole ambient feeling that made me enjoy them so much and his voice was just too close to rock. Not a bad voice though to be fair to him. After being sufficiently warmed up by Nightmare Air, it was time for the man himself. 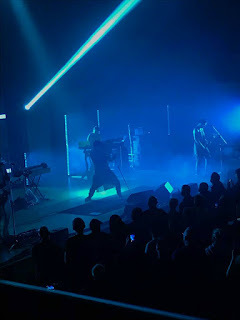 As the auditorium filled up with Numanoids it was just a sea of tour t-shirts, especially those from his anniversary tours. He must make a fortune on merchandise – seriously! 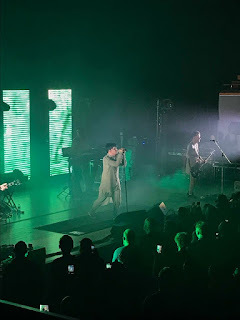 Gary Numan rocked up on stage wearing an all camo, worn and slightly torn gown which slightly matched that of the album cover. He then burst into “Ghost Nation” and immediately I knew this was going to be a good night as the bass shook me in my seat, it was so pulsating throughout the entire night I could feel my head wobbling afterwards, THAT’S when you know it’s a good gig. 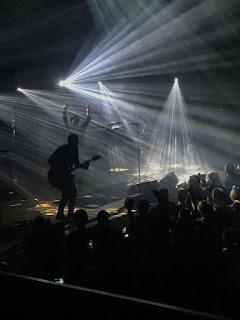 Numan wildly danced on stage all night, you’d be hard pressed to find someone who believed you if you told them he was 60 as he sang his way through the songs though I did become suspicious whether or not he was miming a few of them. It just seemed that he never got out of breath – despite the dancing – and no matter where he held the microphone the level of sound seemed to stay exactly the same. Nonetheless, I’m at least 100% certain that he sang a few of the songs as “Are ‘Friends’ Electric?” was more than evident that he was doing the talking bit in between. I’m not sure whether this is a testament to his talent or the truth.